The United States has voted against a Kuwait-drafted United Nations Security Council resolution calling for the protection of Palestinian civilians, while being the only country to back its own measure condemning Hamas for the recent violence in the Gaza Strip. More than 120 Palestinians have been killed and thousands wounded by Israeli forces during weeks-long peaceful protests in the besieged Gaza Strip near the fence with Israel. Among the victims have been medical professionals and journalists. Ten countries, including Russia and France, voted in favour of the Kuwait-sponsored resolution on Friday. Four others – Britain Poland, the Netherlands and Ethiopia – abstained, while the US, a major ally of Israel, was the only country to vote against it. The resolution, which was revised three times and said to have been “watered down”, previously called for international protection for Palestinian people. The final draft called for “the consideration of measures to guarantee the safety and protection of the Palestinian civilian population in the Occupied Palestinian Territory, including in the Gaza Strip”. Nikki Haley, U.S. ambassador to the United Nations, said ahead of the vote. 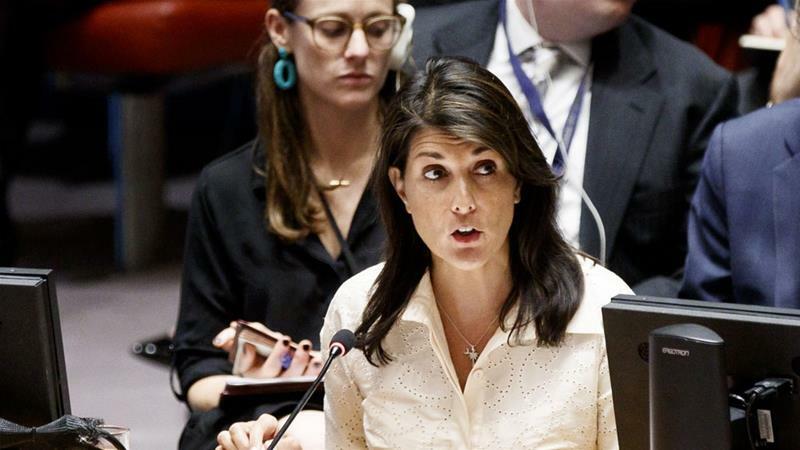 US Ambassador to the UN Nikki Haley described the resolution as “grossly one-sided” as she pinned the blame on much of Palestinians’ suffering on the Hamas movement, which runs the Strip. In a statement later on Friday, Hanan Ashrawi, Palestinian Liberation Organization executive committee member, said the US had once again demonstrated its “blind loyalty to Israel and tried to absolve it of any wrongdoing despite its egregious violations, deliberate massacres and willful killings and war crimes. The US was in turn the only country to vote in favour of a revised draft-resolution it submitted subsequent to the Kuwait-sponsored initiative. The second vote saw 11 countries abstaining and three rejecting it. The US version had omitted references to Israeli use of force and protecting Palestinians. It instead demanded that Hamas and other Palestinian groups cease “all violent provocative actions” in Gaza. Al Jazeera’s James Bays, reporting from the UN headquarters in New York, said the US diplomatic efforts “seemed to have backfired”. “I don’t know when there was last a resolution put to the Security Council that only got one vote in favour,” said Bays. “It seems a very humiliating vote for the US, and one that is very starkly showing the divisions around the Security Council table on this issue,” he added.